In a first of its kind, Career 360 joined hands with Yahoo India to conduct a nationwide Distance Learning Perception Survey . While IGNOU, with its 500 programs and 3 million plus students still retains the top position, Maharashtra has the distinction of being the number one state having the largest number i.e. 23 of institutions offering the Distance Education programs. Distance Learning is increasingly seen as an effective alternate means to acquire actionable skills and knowledge. In India, there are 188 institutes that are listed state-Wise and many more unapproved institutes, both in public and private sector, also offer the programmes. The Directorate of Distance Education is the apex body under the Ministry of HRD, Govt of India that gives recognition to the Universities and Institutes offering the courses in the Distance education mode. In this modern, ever-changing environment, a young man or woman who is working and needs to have a degree or knowledge of a niche subject and acquire advanced skills then Distance Education has the answer. People who cannot take a break from their career can take up these specially designed programs in line with their aspirations and career needs. A full fledged MBA, MA, MSc or/and Instructional Design, Retail Management. Supply Chain Management, CRM, Taxation are possible through this flexible and self paced learning ecosystem. 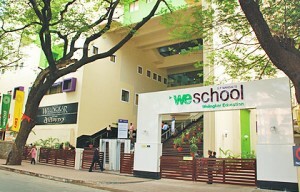 What gives WeSchool that special edge over others? Along with providing “VALUE FOR MONEY”, the programs are aimed at holistic development of the student. The institute ensures that SUPPORT and SERVICE level to each and every student is maintained efficiently irrespective of his location throughout the globe and a student never made to feel that he/she is doing the program from a DISTANCE. Quality of Course material A very scientific approach is followed for study material development. There is a team of subject matter experts, who develop the study material. All study material is developed as per SIM (self instruction mode) methodology recommended by DEC.
Periodicity of Updation In line with rapidly changing business environment, new subjects are introduced at regular intervals as well as content for various subjects is updated frequently. In last financial year, out of 75 subjects, content for nearly 25 subjects was revised. Also, new subjects like, Recruitment Management, Customer centric organisation, International HRM etc. have been introduced recently. Dispatch system In case, a student comes personally to the institute for admission, the study material kit consisting of books and cds is given to him on the spot . Also, all his online facilities get activated automatically from the same moment. In case, a student sends application form through courier, study material kit is sent to him within 24 hours of receipt of application documents. Also, he receives SMS communication about his admission and roll number. Administrative response The institute has a dedicated team to respond to all queries received from current as well as prospective students. In fact, as soon as a student joins the programs, he gets all his exam dates , lecture dates and other information from the very first moment of joining. A student can contact the institute through phone or mail. Additionally, there is a facility through website, wherein, a student can refer all sms as well as email communication sent to his batch for any time period. Personal contact programs The Institute conducts Personal Contact Programs for first and second semester students four times a year prior to the midterm as well as end semester examinations for the first year. Presently, the contact programs are conducted at Mumbai .. The Personal Contact Program will last for about 6 days each semester. During this period, a minimum of 7 hours per subject will be covered in a classroom environment. During PCP, entire portion is not covered, but major concepts are explained. The PCP is optional but highly recommended since they encourage peer interaction amongst the students and provide opportunity to clarify doubts related to the curriculum. Exams The two years’ Post Graduate. Programs are divided into four semesters each of six months. During every semester, students are required to appear for two rounds of exams. They are called as midterm and end term exams. These exams are online with multiple choice questions pattern. Students are given around twenty days of time, during which they can appear for exams as per their convenience from Aptech centers near their houses additionally, students are also required to submit a project report of 200 marks in their final semester. Value added services Further, In addition to academic studies, students are provided a number of value added services , which helps in their holistic development. We Tube and Newswire Service are two such initiatives. We Tube is a series of video lectures on latest topics specially delivered by experts in various Management fields. Newswire Service is about the latest developments in the field linked to the specialization of the student and is available to him through the link on our website. In Newswire section, a student can see various news articles related to his/her specialisation on daily basis and thus , can remain in touch with practical world. Experiential Learning Workshop All the students enrolling for PGDBA-DLP are encouraged to undergo a 2 – day SOFT SKILL program through experiential learning methodology. Apart from learning soft skills like Communication, Leadership, Teamwork etc., the students also earn additional bonus marks for attending this program. WeSchool students have a definite edge over students of other institutes. Industry visits We at Welingkar believe in balancing theory and practical training. During the course duration we take our students for a few industrial visits. We take a group of students for a guided tour into the premises of various industries, providing them information about the background of the companies and their current position in the global business scenario. Industry interface enables students to analyze and understand the ever changing dynamics of the industry. These visits provide students with adequate exposure in tackling live problems encountered in the working of an industrial entity. For convenience of the students, a new initiative has been taken by the PGDBA-DLP cell – Placement information including global vacancies are uploaded on our website http://www.welingkaronline.org on a daily basis. A student after enrolling for the program can see all job openings, statewise, spacializationwise on the website under the head Placement Opportunities. Thanks for a fine blog posting. I love the fun remarks. I am generally to running a weblog and i essentially admire your subject material. The article has actually peaks my interest. I am going to bookmark your web-site and hold checking for new data. We came throughout this fantastic site and wish to show how grateful I? ?m for you for sharing this good understanding.